The Navratri fast is observed from the first day to the ninth day of Ashvin month. People take bath in the morning and evening during this period and some even drink water only after the ritual bath in the morning. Fast is observed by people for seven or eight days, depending upon when they want to conduct the Kanchika Pujan (when young girls are worshipped). People follow a specific diet for Navratri, if they haven’t observed a nirahar fast. Most people nowadays perform partial fasting. They would abstain from non-vegetarian food, alcohol and those dishes that are made of common salt or any kind of spice. Singhare ka atta is used to prepare rotis or puris, for the fast. Some devotees only observe fast during three days i.e., first fast during any one of the first three days and second fast during any one of the next three and last in any one of final three days. 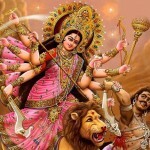 He festival in Calcutta, India, in the state of West Bengal, honors Durga, who rides a lion and destroys demons. She is one aspect of the Mother Goddess and the personification of energy, and is famous for slaying the buffalo demon, Mahisasura. During the 10 days of Durga Puja, the city becomes one great festival, with deafening music and fireworks. Before the puja, artisans have constructed clay figures over straw-and-bamboo frames, some of them 10 feet high. Stages are set up for these figures in neighborhoods throughout the city, and for four days throngs of people admire the clay tableaux, often showing Durga on a lion slaying demons. On the fourth night, the images, which are genuine works of art and have cost as much as RS100000, are taken down from the stages, placed on bamboo stretchers, and carried—to the music of hundreds of bagpipers and other musicians—to the banks of the Hooghly River and tossed in. As they float toward the mouth of the Ganges, they dissolve back into clay, straw, and bamboo.